What is The Picky Pledge? Well, it's a partnership between me and Alexa from Alexa Loves Books where we hold each other accountable for the books we've acquired in 2015. For more details on The Picky Pledge, be sure to visit the introduction post. We're excited about making more intentional reading choices this year! For this section, we were inspired by our original stats post from earlier this year. Since our Picky Pledge keeps us on track with review books and buying, our check-ins will highlight the two charts relevant to those areas! My reading has been all over the place this year! I was in a slump for the first quarter of 2015, but then I was able to break out of it during the second quarter. My desire to read dramatically improved, and I made it through a lot of books during that time. Then, the third quarter came around... and I've fallen back into a slump. 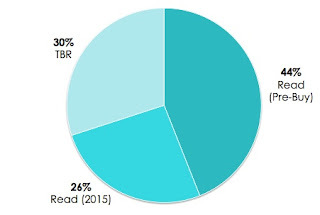 I've read 124 books this year: 32 in the first quarter, 62 in the second and 30 in the third quarter. I hope that I'll feel that pull to read more this fall, but I won't worry about it if I don't. I'm pleased with my breakdown: 25 were read for review, 16 were books bought in 2015, 13 were borrowed (library and friends), and 70 were books that I owned (TBR and re-reads). I'm definitely focusing more on books that I own (and re-reads) rather than review books, so I already feel like Picky Pledge has been successful! As with my last check-in, my progress is good but not great. When comparing it to last year, I'm doing much better, but I know that I've still got room for improvement... I've purchased 74 books in 2015 (8 with gift cards and 66 on my own) and been gifted 25 books. My breakdown above only takes into account books that I bought on my own, since that's what I'm tracking with the Picky Pledge. Of those 66 books, I've read 17 since I bought them, 20 are on my TBR, and 29 were books I read prior to buying them (review books, different editions of a favorite, etc). I'm hoping that I'll finish the year strong and take what I've learned and do better in 2016! 1. It's exciting to read a pre-order as soon as it's in my hands! I've been trying to make fewer "spur of the moment" book purchases this year by pre-ordering the books I know that I want to own. Even better, in a lot of cases, I'm reading the book as soon as I get it. I forgot how much fun it was to read a book immediately rather than let it linger on my shelves. Plus, it means I'm doing a better job at being pickier about what I buy! 2. Buying books I've already read fills the shopping urge but doesn't add to my TBR. I recently wrote about this book buying quirk, and I really enjoyed the feedback I got on the post! I genuinely love spending money on books, supporting my favorite authors, and adding favorites to my shelves... It's been nice to focus on buying (and keeping) books that spark joy, as inspired by this book that I read a few months ago. 3. Re-reading old favorites shifts my focus from review books and reminds me of why I started blogging! I think this has been one of my best discoveries of the year, and one of the biggest things that has made the Picky Pledge worth it. I wanted to re-read 36 books this year, and I've surpassed that goal (with no intention of stopping). I've loved revisiting favorites and getting the added benefit of remembering my reading priorities. 1. I can't break out of a reading slump by buying books. This probably goes without saying, but it's definitely something I have to keep in mind. Sometimes I mistake not being in the mood to read anything with not being in the mood to read what I currently have in front of me, so I'll go out and buy something new. It rarely helps my reading mojo... and instead results in adding more books to my TBR. This isn't the solution! 2. When considering a review book, I need to consider whether I'll really read it by publication date. 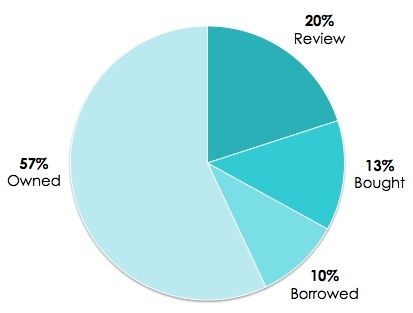 My goal is to read no more than 36 review books in 2015, and I'm still on track for this goal! However, there have been a number of books I've requested that I was genuinely interested in reading, but I never got around to them by their publication date. It would have made more sense for me to request those books from the library! 3. Tune out Twitter when new review books are added online! I've been a little checked out of everything online lately, Twitter included, but I've somehow managed to sign in on the days when books have been added to NetGalley or Edelweiss. Without fail, I always go look at what's new - even if I can't think of anything I've been wanting to read. I need to learn to ignore the excitement because I don't need more review books. I love the idea of being reminded of why you started blogging -- I've been doing a lot of thinking about that lately myself! I need to do a bit of an unofficial Picky Pledge myself -- I think it would help with some of the goals I've recently set for myself, mainly to buy less and read more from my TBR :) Re-reading is also something I'd like to do more of! I love these posts and I've really taken a lot of your advice to heart. I haven't kept track but I know I've cut down dramatically on books I've purchased this year, as opposed to other years. I'm trying to use the library more, including suggesting books for purchase if they don't have something that I want to read. And buying books you've already read really does fill that shopping hole without the TBR guilt, it's so nice! I bought a couple editions of Ella Enchanted and a few review books that I loved and wanted to support. I've already decided that I'm probably not going to request any books next year, or very few anyway. I got a stack at ALA in June and definitely read some right away, but all of a sudden I have 5 books coming out this week or next that I haven't read that I have arcs for and I feel so bad! The dates totally snuck up on me. But I've been good at getting ebooks read, which I had neglected for awhile. I need to be better at reading pre-orders right away! That really is the best way to judge whether you really want it, you're right. I hope you're able to break out of your slump again <3 I think one of my resolutions will be to write myself some picky pledges to stick to in 2016. I think I probably need to pay attention to your improvement plans myself when it comes to review books. I have been better about reading books before or near pub date (with so many books from BEA that are Fall releases it's impossible to read all) but I think I probably need to take a hard look at my review stack again and make some decisions on what to cut. I created an "arc adoption" system on my blog to try and get ARCs to people who WILL be able to read books in time and give them proper attention but there is still a bit of guilt sometimes. Alas!